I had one of those too! I got it when I was in the Army. It was one of those "barracks bikes" sold to someone else around the bikes when the owner gets transferred someplace else. I kept it though and had it until about 1985. I remember it was really fast. I don't know if I was to ride it today if I still would think the same. Sure would like to try though! It was my second bike, my first was a Honda 350. Congrats, on another great blog! I'll add it on to my blogroll. My 2nd bike was a 1980 KZ550. I never really liked the bike I hate to admit, but that's not the bike's fault. The guy who had it before me frigged around with it a lot and I don't think he knew what he was doing. I didn't know either mind you - but at least I had the sense not to mess with stuff I wasn't familiar with. Had a KZ400 too. 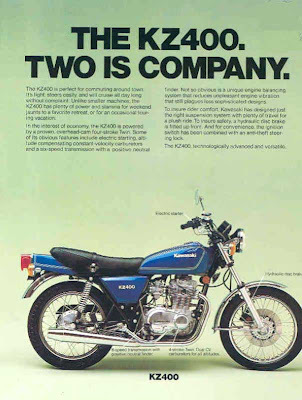 I remember it was not as smooth running as my buddy's Honda 350 and did not have an electric start. But, had a ton of fun with it and wish I had never sold it. Would like to own another one just for old times sake. i just bought a 1975 kz400 and it is in great condition im searching for parts and it is hard to find.new tires,a ebay air filter and a search for brake pads.its fun leakes a little oil and it has loud strait pipes. 12,000 miles and still rockin. i was also born in 75 and we run so when i saw her i was hooked. I was attending UT of Knoxville, in 1979. Never had the money to afford a z 400 but now at age 53 I just found an old 1979 Z400 h ltd model. Its been sitting for a long time but Ive put 20 hrs in cleaning it up and getting it ready to go. Looking forward to riding it soon up in The Smokies. Brings back lots of memories. I know Im gonna enjoy it!